DocX is a file format used by Microsoft Word processing software. Usually, it contains text, images, formatting, styles, drawn objects, and other document elements. RTF, or Rich Text Format, is also a text format used for storing rich text; unlike Doc and DocX, this format is used by WordPad and is compatible with various applications. They include but are not limited to: Microsoft Word 2010, Corel WordPerfect Office X6, Nuance OmniPage 18, and virtually any text editor that supports formatted text. To be able to view DOCx files in any text editor, we suggest you convert DOCx to RTF. If you are looking for a program with standard and easy-to-use interface, then Total Doc Converter by CoolUtils is right for you. But if you are using web server and need a high-quality DOCx to RTF server converter, then you'd better try Total Doc Converter X. <options> stands for the actions command… to convert DOCx to RTF or perform other actions. A full list of commands supported by Total Doc Converter X is available on the official website of CoolUtils. 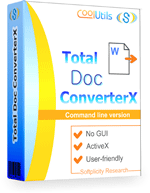 Total Doc Converter X has ActiveX, which allows to make this converter a part of existing web application. 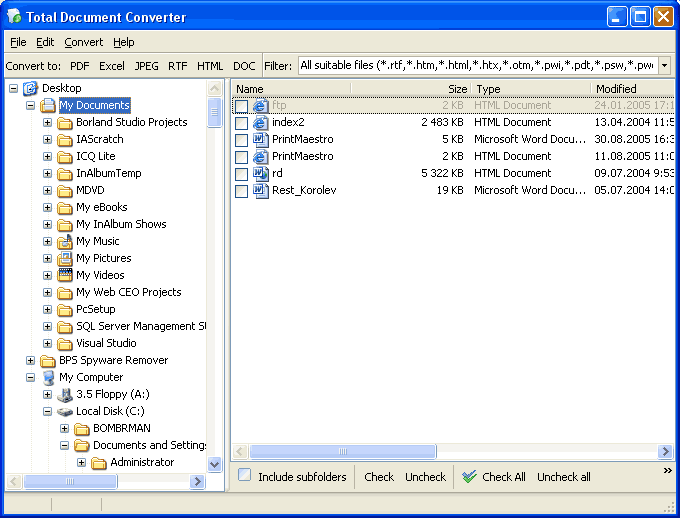 Convert DOCx to formats other than RTF with CoolUtils advanced converter! Supported formats include PDF, XLS, HTML, JPEG, TIFF, TXT and Unicode TXT. To learn more about his program, contact CoolUtils customer service or download a free trial version of Total Doc Converter X now! Use it for 1 month and make the right choice!